Each of the stages denotes a certain orientation towards change that will be reflected in the decisions a young person makes about their substance use. By examining these decisions, youth AOD practitioners can gauge a young person’s motivation to change. The Transtheoretical Model’s central organising construct is the ‘Stages of Change’. Each of the stages denotes a certain orientation towards change that will be reflected in the decisions a young person makes about their substance use. By examining these decisions, youth AOD practitioners can gauge a young person’s motivation to change. Motivation is identified as a critical factor in the success of people who modify their substance-using behaviour (Miller & Rollnick, 2002) and has been shown to strongly influence help-seeking behaviour and treatment participation (DiClemente, 1999). Miller and Rollnick (2002) describe motivation as ‘’...a state of readiness or eagerness to change, which may fluctuate from one time or situation to another’’ (p14). Fluctuations in young people’s motivation to change are likely to be more common than for adults. Clark (2001) points out that young people are constantly changing, as are the severity, magnitude and frequency of the problems they face. As such, it is common for young people in the process of changing to move between stages. Youth AOD practitioners are therefore advised to continually gauge young people’s motivation and readiness for change and customise their approach accordingly. Pre-contemplators are not intending to change their substance-using behaviour in the foreseeable future. Young people in this stage are not interested in changing and will either be or appear unconcerned about their substance-using behaviour. This can be the case even when the adverse consequences of their substance use are obvious and concerning to others. For this reason parents, guardians and courts commonly exercise their duty of care and compel young people in their care to modify their substance-using behaviour. This often provokes resistance from the young person and leads to their erroneous characterisation as “unmotivated”. Rather, resistance signifies that different motivations are driving a young person’s actions. Further, young people with backgrounds of social disadvantage who continue to live at the margins of society often develop a capacity to tolerate adversity. For such young people and those closest to them, problems stemming from substance use can be seen as a natural part of life. In general, young people who don’t believe that change is possible are also likely to be pre-contemplative. This orientation towards change can be reinforced when a young person is unaware that programs and services exist that cater for their needs and preferences. Noticing or worrying about adverse consequences, e.g. physical, legal, relationships etc. Young people in the contemplation stage continue to focus on what for them are the benefits of substance use; what they like about it. However, contemplators have also experienced and give weight to the adverse consequences; the things that they don’t like about substance use. People who are contemplators may also be considering the benefits associated with changing but are likely to be acutely aware of what it will cost them in effort, energy and loss (DiClemente & Velasquez, 2002). This balance between consideration of the costs and benefits of changing can produce profound ambivalence that can keep young people stuck in this stage for long periods of time. The desire to resolve the internal conflict and dissonance experienced as a result of this ambivalence can spur a person on to make changes (DiClemente & Velasquez, 2002), but can also result in a young person resorting to the short-term solution that substance use offers (Bruun, 2008). Inexperience and being either uninformed, under-informed and/or ill-informed. The intention of a young person in ‘preparation’ is to make changes in the immediate future. The model’s underpinning theory holds that people form this intention when the costs associated with substance use substantially outweigh the benefits, and/or the benefits of changing outweigh the costs. A move into the ‘preparation’ stage brings the model’s ‘Self-Efficacy’ construct into focus. Adapted from Bandura (1977, 1982), it represents the confidence a person has in achieving a specific outcome. Intending to change is very different from making changes. A strong sense of self-efficacy increases the likelihood of transition from the ‘preparation’ to the ‘action’ stage. This transition is particularly challenging when substance use has been ubiquitous in a young person’s life and when it continues to be for others in their immediate social network. These young people may need assistance to understand that alternatives to a substance-using lifestyle exist and could be a realistic option for them. If and when such alternative pathways are embraced, specific goals may be set and alternative strategies for pursuing them explored and mapped out. A young person may have been at the point of changing several times in the past. Change is motivated either by the desire to resolve or escape problems (avoidance) or to achieve some benefit (approach). Where a young person’s lifestyle has featured problematic substance use, avoidance rather than approach factors are likely to have a stronger influence. The decision to change is often made when young people reach or exceed the limits of their tolerance for the complications associated with substance use. Carers are advised to be mindful of how demoralising it can be for young people who have formed the view that change is required but not possible. Substance use might be used as a mechanism for coping with these feelings and there is a strong possibility of regression. Further, there is heightened potential that a young person in such circumstances will engage in other ‘risk’ behaviours and may feel suicidal. ‘Action’ is the stage in which people apply themselves to the task of changing a behaviour and make observable modifications to their lifestyle. Action requires considerable commitment and an investment of energy into change processes. It involves implementing viable strategies to achieve goals set in the preparation stage. In the action stage, self-efficacy is expressed through coping with high-risk situations and not regressing to an earlier stage. Carers should remember that the changes a young person makes on the first attempt may not last. It is far more common for people to make multiple attempts to change substance- using behaviour before finally succeeding (Polivy & Herman, 2002). Maintenance is the stage in which people consolidate the achievements attained during the action stage. The transition from ‘action’ to ‘maintenance’ is gradual, requiring sustained change for a sufficient period. Maintenance is signified by a young person feeling relatively stable and more confident in continuing to pursue their goals. Even so, those in maintenance remain attached in some way to their former substance-using behaviour. This necessitates ongoing efforts to prevent ‘lapsing’ or ‘relapsing’, but less frequent application of change processes than would be required in the action stage. While young people’s decision to change is most often made in response to the negative consequences of substance use (avoidance motivation), it is essential that young people have constructive options to work towards (approach motivation). People can overcome their emotional and physical attachment to substance-using behaviour (Prochaska et al, 1992). This signifies a completion of the change process, also known as ‘exit’. This is typically associated with significant lifestyle change. Even so, for some the attachment to substance-using behaviour is continuous. In such cases, people remain in maintenance. 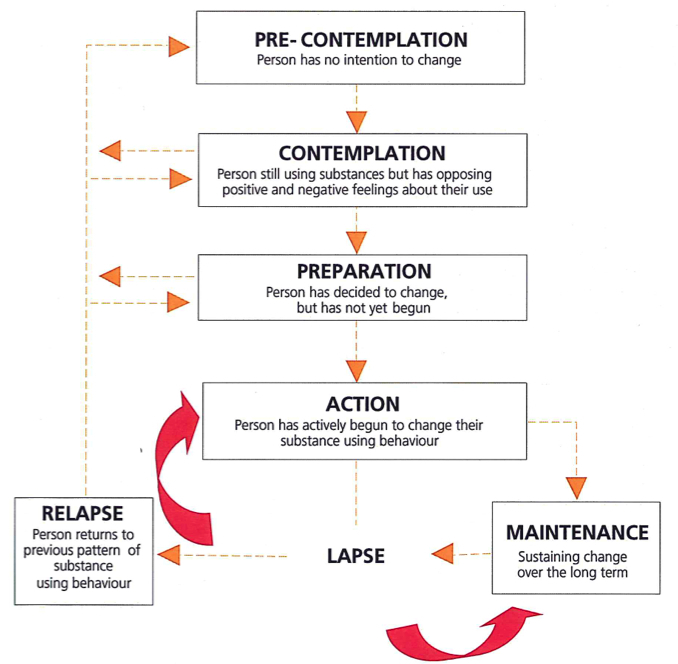 Relapse involves regression from action or maintenance to an earlier stage and is evidenced by a return to previous problematic patterns of behaviour. Relapse is both an outcome and a process that at some stage involves an initial setback or ‘lapse’ (Witkiewitz & Marlett, 2004). A lapse is a brief or limited incident of substance use. This brief return to substance use does not constitute a relapse. Further, lapse does not automatically lead to relapse but is a step in that direction. Most young people in the process of changing and significant others in their social network will invariably view any regression negatively. The loss of perceived control often results in self-blame and a diminished sense of self-efficacy. The presence of these feelings after the breaking of a strong resolution to change is known as the ‘abstinence violation effect’ (Curry, Marlatt & Gordon, 1987). Both ‘lapse’ and ‘relapse’ present an excellent opportunity for the kind of self-discovery and learning necessary for sustained changes over the long term. People generally learn more from their setbacks than from their successes. Further, studies repeatedly demonstrate that attempts to modify a range of behaviours, including substance use, result in at least one lapse followed by relapse (Polivy & Herman, 2002). While lapse and relapse are not guaranteed, both should be seen as a natural part of the change process.